We are visiting a place we never knew existed. You see, we grew up in the South and in the South you don’t know (or care) about any places up North. However, there is such a place, in New York, no less, called Thousand Islands. It's a Region. When I was a teenager, we talked on the phone. That’s what teenagers did in the 60’s and 70’s. (And the 80’s). There was no e-mail, i-message or text messaging. We actually communicated via the telephone. And to miss a call… well that could be crucial to your social development. While sometimes away from that land line (or home), I would always assume my Daddy would be taking messages for me. “I just told you.” And that was that. So, of course, I never knew who called. In addition, I thought Thousand Island was a place my Daddy made up. Right? I‘ve learned that my Daddy was so much smarter than I ever imagined. He knew there was such a place. Thousand Islands. Now, being here, I only wish I had really been there when he told that person I was there when they called! This part of the country is beautiful this time of year (September). Though it may be the shoulder tourist season, and lots of things are closed (or diminished) already for winter, we are enjoying the weather. We also are loving these little tiny communities that we are stumbling across. Houses of all sizes line the St. Lawrence River. I don't believe there are strict covenants and restrictions here. Everyone seems to take care of their places and the ones we have seen are all well groomed and manicured. We saw mansions from yonder years, once glorious but now struggling to “stay alive”. These mansions are housed their own little island. We even visited Bondt Castle, the biggest tourist trap you’d ever see, but even THAT house has much class and has been well-loved. which he is said to have been roasted. and Right Island is American. The SLR is our first taste of the Thousand islands. 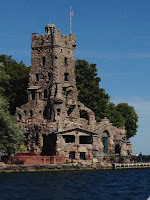 (But they tell us that there are over 1.800 islands in this place called Thousand Islands). We crossed over the Thousand Islands Bridge and got a taste — eh? — of Canada. 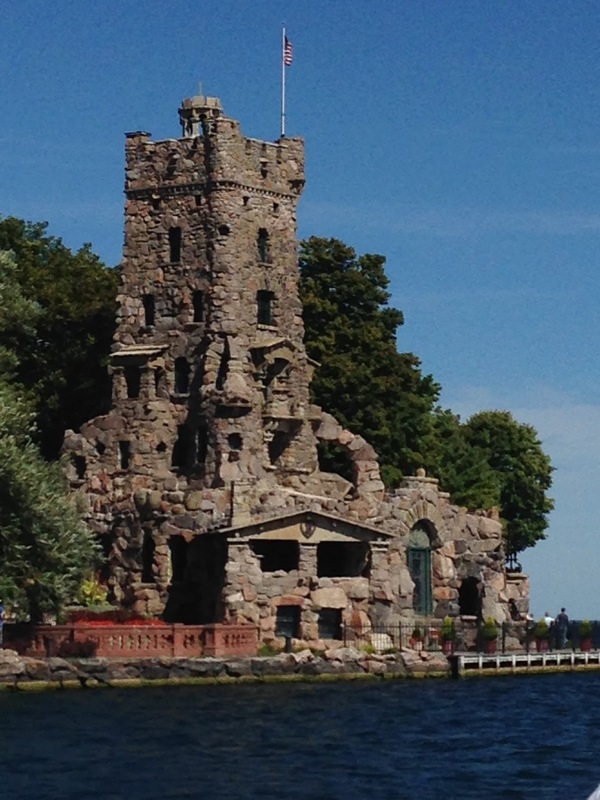 There’s a tower there…(of course) the Thousand Islands Tower. If you climb up the spiral staircase, you can see all the islands, we were told. (There is also an elevator). Only it was raining the day we were there so we didn’t bother because you really need a clear day. They tell us the area is in drought. The River is way down. But it is so clear and pristine! We are betting it is cold, though we are told it is pretty warm for this time of year… 75 degrees. The sky is crystal clear and sun is perfectly warm. A great time to visit. Except when it is rainy. Then the temp drops 20 degrees and you can only imagine what winter must be like here. Ever wonder where Thousand Island Dressing originated? Yep. You guessed it. Right here in the Thousand Islands region. And you didn't even have to GOOGLE it. This place has been the summer homes for so many people for so many years. We’ve seen overnight trailer parks, permanent trailer parks, small little batches on the edge of the water, regular sized homes and million-dollar mansions. We, from the south, can liken all this to the FLORIDA that we know. The only difference is... People are nice to you here. It’s a great place to visit. But I wouldn’t wanna live here.